[AUTO](RC):[Counter Blast (1) & Put this unit into your soul] When this unit’s attack hits, if you have a «Pale Moon» vanguard, you may pay the cost. 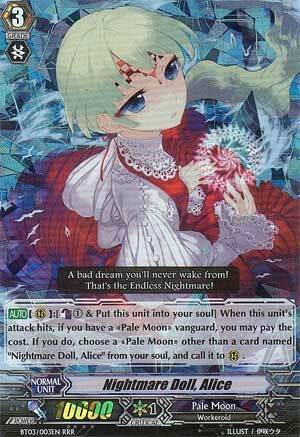 If you do, choose a «Pale Moon» other than a card named “Nightmare Doll, Alice” from your soul, and call it to (RC). The workhorse of old Pale Moon that wasn’t Luquier. I remember Sword Magician Sarah back in the day. She was fun.